The Cardinals lived up to their billing as the top overall seed in the tournament, though they sure had to work for it. Injured Ware basks in victory. Louisville rallied from a 12-point deficit to beat Michigan 82-76 in the NCAA championship game Monday night. The Louisville Cardinals entered the NCAA Tournament as the best team in the country and they're exiting it the same way. Louisville came back from 12 points down in the first half and became NCAA men's basketball champions for the third time in school history in a thrilling 82-76 win over Michigan on Monday night in Atlanta. "This team is one of the most together, toughest and hard-nosed teams," coach Rick Pitino said. "Being down never bothers us. They just come back." The victory capped a memorable day for Pitino, who promised his team he would get a tattoo if they won the championship. Pitino found out earlier on Monday that he will be inducted into the Naismith Memorial Basketball Hall of Fame and then doubled down on the honor by becoming the first coach ever to win national titles at two different schools. Louisville guard Michael Ware, whose right leg snapped in a freak injury during the regional final, cheered on Monday's game from the sidelines with his leg propped up on a chair. After the win, he took to the court on crutches to celebrate -- and cut a strand from the game's basketball net to mark the achievement. "These are my brothers," Ware said. "They got the job done. I'm so proud of them." The milestone win did not come easily. The Cardinals went down 12 points in the first half thanks to one of the more unexpected twists in any title game. Michigan guard Trey Burke, who won every national player of the year award, left the game with two fouls and the Wolverines turned to little-used freshman Spike Albrecht for most of the first half. Albrecht, who averaged 1.8 points per game this season, hit all four threes he tried and scored 17 points to turn the game on its ear. Luke Hancock turned it right back. Hancock hit four straight threes to close out the first half and Louisville trailed by just one point heading into the break. After the break, the game was a seesaw affair that ultimately turned thanks to Peyton Siva and the Cardinals' work on the boards. Siva scored 14 of his 18 points after the break and was a relentless source of pressure for a defense that rattled the normally unflappable Wolverine offense. And the Cardinals had an 11-1 edge on the offensive glass, resulting in second chance point after second chance point. 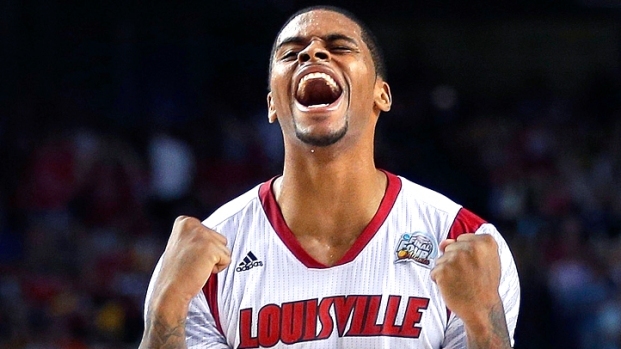 None of those was bigger than a Chane Behanan putback with 1:52 to play to put the Cardinals up by eight points. Behanan took the ball back up through several Michigan defenders and put in the hoop to deflate one of Michigan's many attempts to grab control of the game. You can find flaws with how the Wolverines played in the second half, especially some foul management in the final minute that coach John Beilein came about because he thought the team was already in the bonus when they were one foul short. But Burke was spectacular, scoring 17 points and making a block after running down Siva that was called a foul in the most egregious of the many questionable calls by an officiating crew that was not up to the championship stage. As good as Michigan was, though, Louisville was simply better. They took some big shots from Michigan and walked through them like the experienced tournament team that they are. Siva, Hancock (who was named the tournament's Most Outstanding Player), Behanan and Gorgui Dieng all had huge moments in the second half while the younger Michigan team wilted under the pressure of the situation. The Cardinals, who rallied from 12 down against Witchita State as well, proved their mettle on Monday night and made it clear how deserving they are of the title as the best team in college basketball. All in all, it makes for a day that Rick Pitino won't soon forget.